Xspouse 2019 provides a fully-integrated qualified business income deduction calculator that is accessible via the detail window for the "Qual bus income ded" field on the main screen. 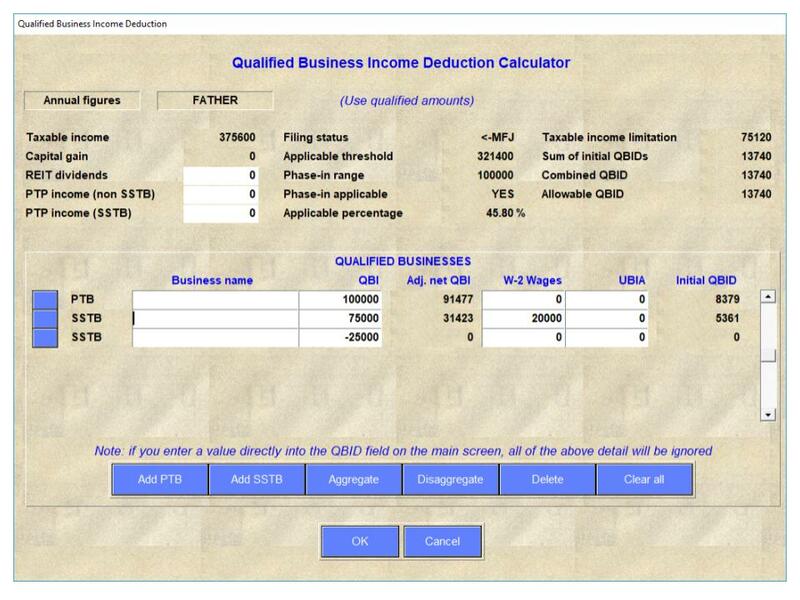 As with other input fields on the main screen, a value for QBID can be entered directly into the field, or the QBID value can be computed by opening the detail window to display the QBID calculator, and entering the qualified amounts for QBI, W2-wages, and UBIA. The calculator provides buttons for adding and deleting PTBs and SSTBs, and for aggregating/disaggregating PTBs. The QBID calculator automatically takes the filing status, taxable income, and capital gain information from the currently open case in order to calculate the various parameters, such as the applicable threshold, phase-in range, applicable percentage, and others. If businesses with a negative QBI are added, the calculator automatically follows the netting rules set out in the regulations. If a QBID value is entered directly into the "Qual bus income ded" field on the main screen, any data that had previously been entered into the QBID calculator will be ignored (but not deleted). If the calculator is subsequently re-opened, and the 'OK' button clicked, then the QBID value that is computed by the calculator will again replace any value that had been entered directly into the field on the main screen. Xspouse 2019-1 builds on Xspouse 2018-1.1 in treating spousal support judgements post 2018 as being non-tax items federally, and treated as adjustments to income for state taxes. In conformance with the new FL-150, Xspouse 2019-1 includes new input fields for taxable and non-taxable spousal support payment in the detailed input windows under “SS paid prev marriage” and “Other taxable income”. Additionally, a switch has been added to the Settings screen to allow activation of federal tax for spousal support, if required. If this switch is set to “YES”, a new warning message is displayed on the main Xspouse screen to indicate this fact. 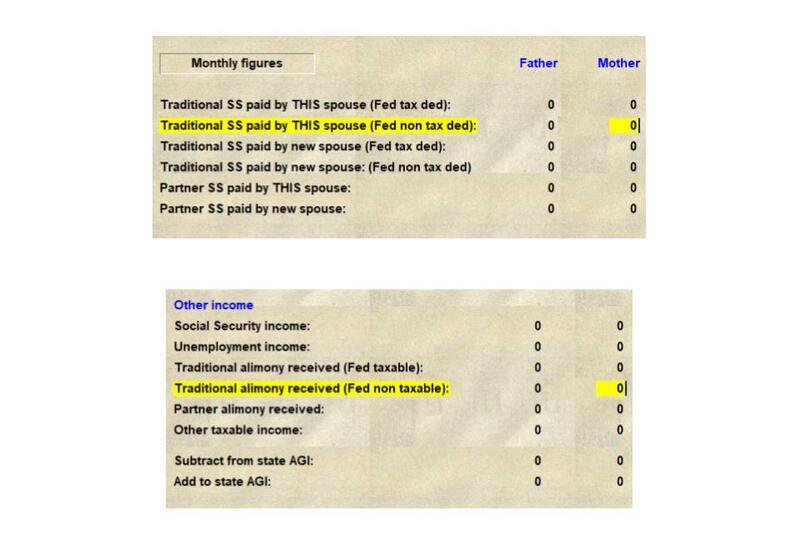 Note: The default in Xspouse is 'NO', as this conforms to the federal tax changes.